My 1946 Southern Publishing Booklet “Brighton & Hove Under Fire” states on the front cover “Photos the Censor Would not Pass”. It’s probably for this reason many of the captions on Brighton WWII photos are incorrect. I fell victim to it myself with my 2008 story of the bombing of Stapley Road, which you can see here the photo turned out to be Olive Road. I think that with most of the Brighton bomb damage photos being censored, at that time they were not well catalogued, and when they were released for publication in 1946, mistakes were made; in particular buildings that looked similar were muddled, and then incorrect captions published. Marine Gate or Portland Gate? 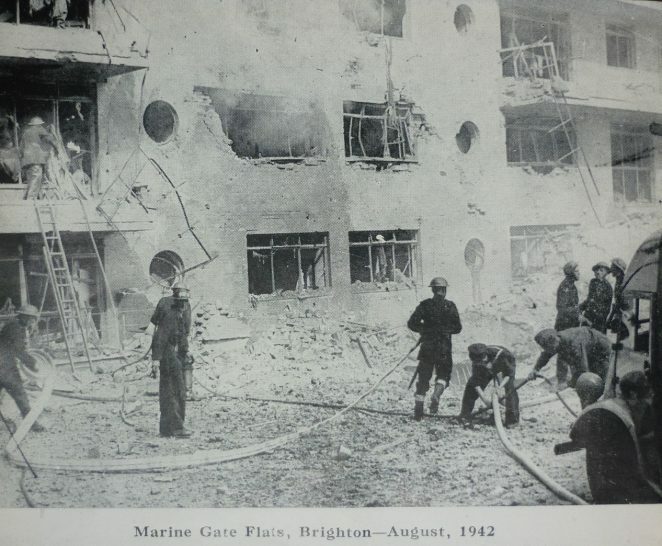 The bombing of Marine Gate seen here is in fact not Marine Gate, but Portland Gate in Hove. Although it was demolished some time back I remember it well, passing it by bus every day on my way home from school in the early 1960s. At the time I was impressed by the art deco building, thinking it very grand, although in fact by then it was already in decline. I later heard a story that it was owned by Nicholas van Hoogstraten, who allowed it to deteriorate on purpose; in truth probably the bomb was the start its demise! I heard a lovely story regarding the bombing of the real Marine Gate. Someone I worked with, who had lived on the Whithawk Estate during the war, told me that it was evacuated straight after it was bombed, and his parents told him and his mates to “go and see if there is anything worth having”? They got into many of the ‘posh’ flats and raided the kitchens and for many weeks afterwards they feasted on tins of preserved meats, jams, fish, and other delicious foods. I am not sure if this story is true or just Whitehawk bravado, but I hope it is. it would be good if some benefit came for needy families from the bombing. My photo of Marine Gate is the true photo of Marine Gate! Regarding Portland Gate: wasn’t that where the young pilot crashed his fighter early in the war in the Battle of Britain? I seem to recall he was from Nottingham and about 20. They discovered his remains when they were rebuilding the site some years ago. Hi Geoffrey you are correct, it was Sgt. Dennis Nobel, you can read about him here: http://www.mybrightonandhove.org.uk/category_id__1982.aspx The other interesting thing about Portland Gate is that if you look on the Brighton Bombing Map, it does not indicate that a bomb dropped there, the nearest ones were half a mile away. So the caption on the other page, is in fact the correct caption for this (my) photo, but what should the caption be for the other photo? What occurred? Between the ages of 10 and 12 (1959 to 1961) I lived in Bolsover Road and recall my parents telling me of a pilot who had crashed into the northwest corner of what were then allotments. The allotments ran along Portland Road between Coleman Avenue and Woodhouse Road and I was told that, at the time, only one of his hands had been retrieved. When an old people’s care home was being built in the 1970s or 80s the rest of his remains were discovered I believe. Certainly the captions seem incorrect for if you follow Helen’s link to the official report on the bombing of Marine Gate the date is 25 May 1943. The caption on my photo says August 1942, and the Royal Pavilion & Museum’s caption says 16th Jan 1943, but for Portland Gate photo. Confused or what? It seems Sam has solved the mystery, shown in this photo is Marine Gate, but my reference to Portland Gate is incorrect. The Portland Gate photo here http://mybrightonandhove.org.uk/page/brighton_herald_photograph_collection-4 is in fact flats in Rottingdean, and this also explains why Portland Gate does not appear to have been shown as hit on the Brighton Bombing Map, but the flats at Rottingdean do show as having been hit! Hello every one. I have always been interested in the Dennis Noble story as we live quite near. Not long after the dig and the find of the pilot, parts of the plane were set up in the scout hall in Gleebe Villas. The parachute that Dennis had been wearing hung stretched out down from the above beams, bullet holes and blood stains still visible. I was chatting to the guy who was on the dig, there were Noble family in the hall that day and so he spoke softy to me so not to offend anyone. He said to me they were hoping to piece the plane together and show it, possibly at Tangmere. I don’t know what ever happened to the plane and that dream. I remember Portland Gate well, I had a paper round which included Portland Gate. I worked for Tyson Newsagents (later Barrett) at 310 Portland Road in the late 1950s. My round was Ingram Square, Portland Gate and Ingram Crescent. There were 51 flats in all, five separate street entrances, one in Portland Avenue, three in Portland Road and one in Woodhouse Road. Each block consisted of ten luxury flats and flat number 51 was a penthouse which was reached via the only west facing street entrance in Portland Road. The caretaker lived at flat 21 and he kept the blocks spotlessly clean. Each block had a lift which I would take to the top floor and deliver the papers on my way down the stairs. I worked six morning rounds and six evening rounds for a total of seven shillings (35p) a week.